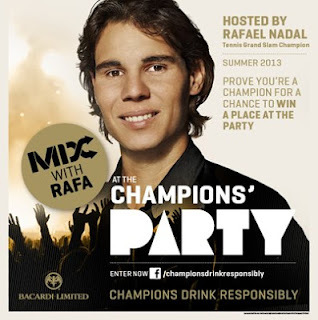 Champions Drink Responsibly: Party with Rafa! The wait is over…... Rafa's hosting a party and you've got the chance to meet him there, in person! Click on The Champions’ Party tab, answer 3 quick questions, and you and a friend could win the chance to meet him at the party. Closes 5.59pm GMT, 18 April 2013. Only open to residents in certain countries. Entrants must be of legal drinking age in their country of residence. Date restrictions apply to prize (which is a 2 night trip to Spain on 19 – 21 July 2013). Terms apply, see http://www.championsparty.com/TermsAndConditions.aspx?code=en for more details.